When I start decorating a cake I am not always sure how it will look when I have finished. I often have a good idea of what I am trying to achieve and sometimes the finished result bears some resemblance to this and sometimes it doesn’t. I don’t think this a good thing: some results are better than others! For her 8th birthday cake, Ella requested chocolate. Having recently discovered the fuschia pink icing I wanted to use that colour again as I think it contrasts beautifully with the chocolate sugar paste. I thought circles in various sizes would look good but I also wanted a topper. When I came to make the topper I couldn’t really work out how to make a good one with the circle sizes I had so decided to add a few fuschia and pale pink hearts. 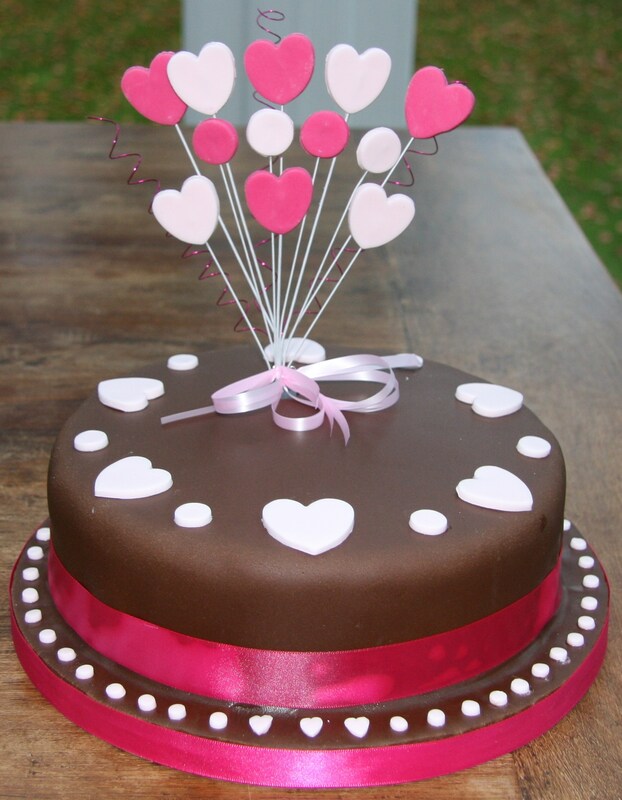 Next thing you know the cake has become more about the hearts! The ribbons add some real colour so I went back to the pale pink for the hearts on top. The circles are really just an accent: not what I was expecting at all. So Ella gets a two layer chocolate sponge cake, sandwiched with chocolate buttercream and covered with chocolate sugarpaste. If you would like the recipe for chocolate sponge and chocolate buttercream please see this post. I made an 8″ cake in a deep, loose based cake tin (using 340g each of sugar and butter, 6 eggs, 300g SR flour, 100g cocoa powder and a splash of milk). In the end I was pleased with my heart cake and hope Ella is too. But I really need to learn how to design a cake in my head properly and stick with the plan. This time I got lucky! Happy 8th birthday to Ella! We ♥ Ella! ‹ Homemade Mincemeat: no mince, no meat and not very pretty, but absolutely delicious! Another beautiful one! Lucky little girl.